Arts and coloring is a simple activity that helps children to develop cognitively, psychologically and creatively. Coloring pages and coloring books are not just plainly art materials or something that your little kids can scribble on. It is one of the most loved pastimes and activity mostly for toddlers and preschoolers. They are not only good pastimes, they are also considered to very educational for children and are indeed very helpful in so many ways. Parents also love giving their kids some pages to color on since it is an activity that will totally spark their imagination and it is a super magnificent way to express themselves. The best thing about coloring is that you don’t have to force or trick your kids to enjoy doing it because everyone totally loves coloring! Even for adults, coloring pages give them something to work on while relaxing. Coloring, as simple as it is, can truly provide lifelong benefits to your precious little ones, and to you too! The ballerina coloring sheets of the book are loaded with cute and pretty little ballerinas to be colored by your little kids. 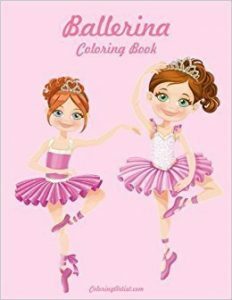 This coloring book contains forty pages of beautiful and adorable ballerinas dressed in pretty tutus and leotards. The Ballerina Coloring Book by Nick Snels is perfect to boost and feed your child’s creative mind and let them have fun! Each picture is printed on its own 8.5 x 11-inch page so no need to worry about smudging. This 11-inch artsy ballerina coloring pages will truly inspire your little kids who have always wanted to be a ballet dancer. A vibrantly illustrated coloring pad perfectly made for the cutest pretty dancers and soon-to-be artists. The skin of ballerinas inside the pages is already colored in for you, in a multitude of ethnicity – which many parents and kids loved! 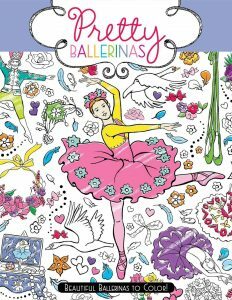 The Pretty Ballerinas coloring book is filled with fabulous dancers and interesting scenarios from few of the most well-known ballet dances. Jam-packed with pretty ballet shoes, shiny tiaras, and many more. Surely, your little kids will have so much fun as they set their creativity free! Swishes of colors on each of the pages will inspire your little artists to make their own beautiful masterpieces. 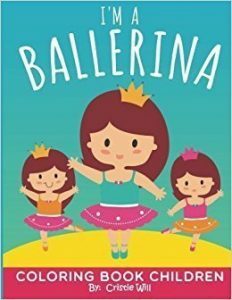 An 11-inch ballerina coloring book that contains more of the cuter ballerinas that totally look like chibis! It also has a very cute book cover that your little ballerina wannabe will truly love. This coloring book by Cristie is filled with inspiring and adorable dance images on each page. Coloring them will get not only inspire to get those tiny feet moving but also their amazing brains to work well. When coloring with Crayons or colored pencils, a child becomes familiar with colors, shapes, lines, and forms. The activity with the coloring book also helps improve social and communication skills for interaction with others. The coloring pages of this book are perfect for your horror and mystery loving kids! It helps them boost their imagination and courage as well. As they start to flip the pages and get into the door of the haunted house they will not know what you’ll see inside. Are there ghosts and monsters? Or witches and goblins? Don’t be scared to play peek-a-boo! Speedy Kids have continually provided kids with books with projects that will require kids to match, trace and color will aid to also bring about more detailed motor skills, while word-related activities create the very much needed knowledge base that all children require – making sure that the effective skills to keep knowledge are improved. This coloring book also measures 11 inches. 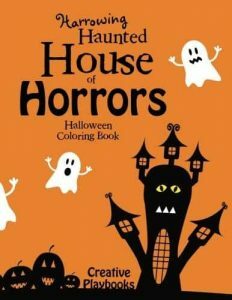 The Harrowing Haunted House Halloween coloring book comes also in a size of 11 inches. 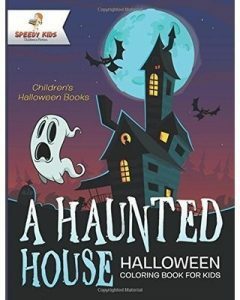 This looks like a cute version of a haunted house, its cover is colored in a bright orange with a spooky and cute ghost upfront. Depending on your kids’ imagination they could go and color the haunted houses in light and happy tones. Or they could stick to the theme and color them to make them look more creepy and mysterious. Creative Playbooks believe that coloring gives you the opportunity to not stick to the usual colors. It allows you to be yourself and to showcase your views on art. This 11-inch coloring book is also by Cristie Will. Your kids will surely love coloring the images inside since they do not contain only police cars. They also include other police vehicles such as helicopters and motorbikes. The images will be super fun to color on with all the red lights and sirens. This coloring book will also help children get familiar with the important vehicles. Coloring police transportation will allow a child to become familiar with them, and therefore, respond accordingly. Coloring is an activity widely recognized for its help in molding hand and eye coordination, along with the essential life skills of patience and self-confidence. 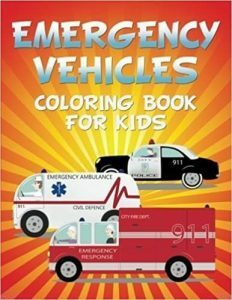 This Emergency Vehicles coloring book is perfect for your kids who get their interests sparked by police cars and other emergency vehicles. 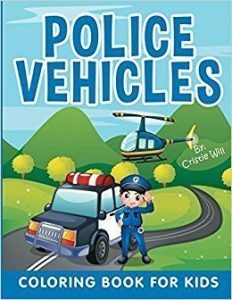 This emergency vehicle coloring book for kids is sure to please, this also helps them in getting familiarized with the different emergency vehicles such as ambulance and fire trucks. This coloring book by Marshall Koontz is a great gift for the young ones in your life. The images are printed on high-quality paper with a beautiful high gloss cover. Dads may also love this 10-inch coloring book about the history of police cars. This coloring book contains pictures and images on the history of the development quick, efficient transport for public safety personnel. 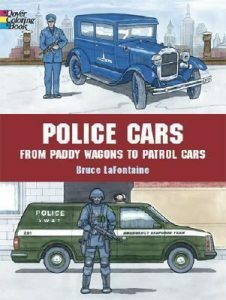 The drawings were inspired by the old police cars, from a 1904 paddy wagon and a SWAT van of the 1970s to a state police armored car of the 1990s. The 44 black and white illustrations even include extensive captions include facts and statistics that you could read and share the details with your little kids. 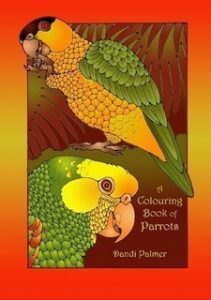 This is a great parrot coloring book for kids since it does not have many patterns or complicated lines to color on. Despite the simplicity of the illustrations, they are still nicely detailed. The background is also simple and bland. Drawings of parrots are just on side of the page so your kids can completely use markers or other coloring materials aside from the regular crayons and coloring pencils. This 10-inch coloring book contains about 20 different illustrations for your kids to work on. 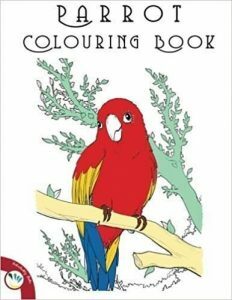 The 11-inch Parrot Coloring Book by Individuality Books is more of the very simple and easy side. Although it is perfect for all kids in every age group, this will be perfect for the much little ones because it does not have any complicated lines or patterns. Large-sized 20 parrot drawings which are located only at one side will be enjoyed by the kids. 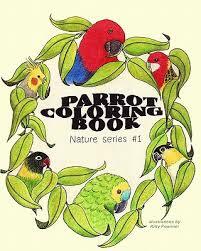 The coloring book includes 4 examples of colored Parrot pages at the back page to get your kids started. Coloring is a form of artistic expression so whether your kids color messily or out of the lines, it will still boost their creative spirits. It can spark the imagination as well to inspire them to think of new patterns and designs for another masterpiece. Working on coloring pages will provide your kids a wonderful opportunity to harness and express their creative side. Creating through color is indeed a very effective way to express one’s self. Some kids want to express their own self through, while some through the use of art. During the coloring activity, your kids will eventually discover which colors go together or how to color inside the lines. You will be surprised that you may even see additional drawings on the sides that they’ve created. Just hand your kid a pack of coloring materials and let their creativity work wonders. Learning the names and shades of color is an important step for kids. An activity related to coloring raises practice and recognition of the primary and common colors. Such as the colors of the rainbow. Coloring effectively improves color and texture awareness. Young children have the opportunity to learn the names of colors, while older children can practice art techniques such as creating dots and scumbling or filling in with round scribbles. Kids who gain knowledge early about the colors and its wheel experience an uncomplicated time in deciphering the properties and combination of colors. Coloring a picture can aid your little ones in recognizing lines, colors, and shapes. You can help them name the shapes they are coloring on, and the colors that they are using. A good reason why most toddler and daycare centers always incorporate coloring activities is to prepare the kids for school. Teachers commonly do and issue lessons, written schoolwork, and homework at school on paper. Coloring sheets can be fundamental and will help a lot in developing kids for a more structured work on the paper on the future. Coloring shapes and illustrations help improve dexterity and hand strength of your child. For many toddlers, crayons or any coloring materials are the first objects that they master to grip in a particular way. It’s very significant for your kids’ practice to have good control and grip when it comes to their writing and coloring instruments. Writing well in both printed letters and cursive script requires good hand strength plus grip. Activities like coloring will aid your kids to handle the writing instrument the right way. This practice will totally improve your child’s handwriting and penmanship. The gesture of holding a crayon and scribbling to color greatly helps in the improvement of motor skills. Coloring helps in strengthening their hand and arm muscles, which will then help with activities like more specific hand gestures, actions, and lifting objects. The activity, mobility and good grip done when scribbling can assist in developing the muscles of the fingers, wrist, and whole hand. Coordination and the ability to focus are two of the most important lessons that your kids can gain from coloring. Filling in the lines of an age-appropriate coloring book helps kids focus on the task at hand while creating something beautiful. It’s been proven that kids who expend a good amount of time coloring will have better concentrations and focusing abilities. Coloring diagrams and illustrations demand your little ones to scribble color within a specific area. It helps them develop a good hand and eye coordination in children. Coloring inside the lines also requires a lot of focus. It also battles cognitive loss, more so if you get those tough and more challenging coloring pages. Every time your kids finish coloring an illustration or two, it successfully builds their confidence. Once they see how pleased you are with their masterpiece, it boosts their confidence too. Regularly working on coloring pages and completing them boosts a child’s sense of being accomplished and take pride in themselves. And this sense of being accomplished will be able to build their confidence and self-esteem. Spending time on coloring pages not only relieves stress among little kids but also for adults. Coloring activity tends to be calming and therapeutic for kids. It is also great for relieving unpleasant emotions and frustrations in them. Coloring is truly great for stress relief and helps kids slow their mind and body down and drift into the world of colors and art. This activity will also be totally helpful. A good example is an angry or frustrated kid may vent out his anger or sadness by doodling over the illustration inside or outside the line, later on, you’ll find that he has already calmed down or relaxed while continuing to work on the coloring project. Most kids love to color, and it turns out that is totally more than just a recreational activity. Allowing your kids to be working on coloring pages has many benefits as it can promote growth and progress both physically and psychologically in a wide range of different specific areas. It is always a brilliant idea to let your kids start coloring as early as possible. Getting your kids great coloring books, coloring pages, and materials will not only give you a great bonding time but it will also come up with a great deal of positive benefits for life. Coloring pages allow your little ones to be relaxed and comfortable while creating a piece of art.